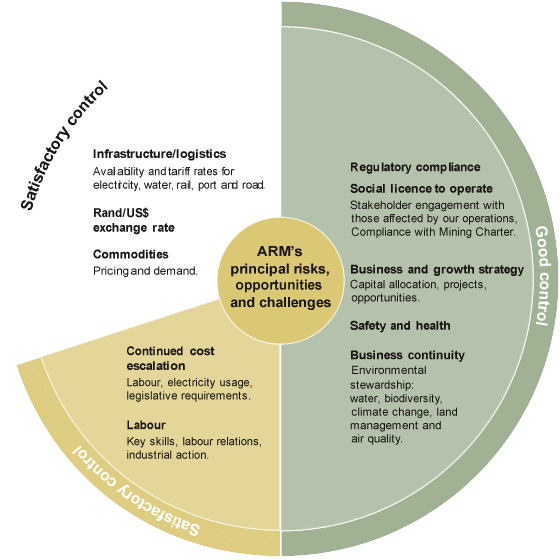 ARM’s material issues are those factors that most impact our ability to create long-term sustainable value. The process of identifying our material issues involves continuous review of both our internal performance and the external environment in which we operate. Engagement with our stakeholders is one of the most important inputs into identifying these material issues. The diagram below shows some of the other inputs we consider in identifying our material issues. These material issues inform our strategy and are monitored and evaluated on an ongoing basis. The implementation of our strategy takes place within the context of our responsibility to comply with all relevant legislation, generating returns for investors, uplifting our communities and maintaining the highest standards of ethical behaviour and corporate governance. 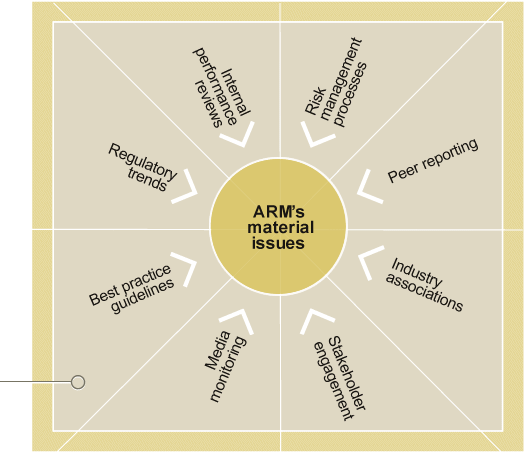 Detailed discussion of ARM’s Enterprise Risk Management and principal risks, opportunities and challenges is included in the Risk report .